All Crime Prevention Programs occur on the third Thursday of each month. The Neighborhood & Business Watch are shared responsibility and connection between the police and community. The goal is to make Bensenville a safer, more livable city through crime prevention and problem solving strategies. 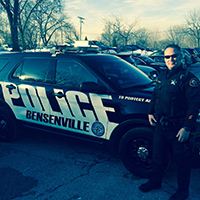 It is part of the overall philosophy of the Bensenville Police Department. The Bensenville Neighborhood Watch does not condone vigilante actions. No one is asked to take personal risks.